MONTREAL – Montreal Canadiens general manager Pierre Gauthier announced Monday the signing of forward Brock Trotter to a one-year, two-way contract. As per club policy, financial terms of the agreement were not disclosed. In 2010-11, Trotter registered 26 points (9 goals, 17 assists) in 49 games with Riga of the Kontinental Hockey League (KHL). Three of his goals were scored on the powerplay. He recorded 74 shots on goal, while averaging 14:26 minutes of ice time per game. He displayed a +3 plus/minus differential and served 38 penalty minutes. Trotter, 24, played 172 regular season games with the AHL Hamilton Bulldogs from 2007-08 to 2009-10, recording 135 points (57 goals, 78 assists). He registered 77 points in 75 games in his last season with the Bulldogs in 2009-10, leading the team in goals with 36 (fourth in the AHL). He ranked second on the team with 19 points in 19 playoff contests (8 goals, 11 assists). That same season, he played in his first two NHL games, with the Canadiens. 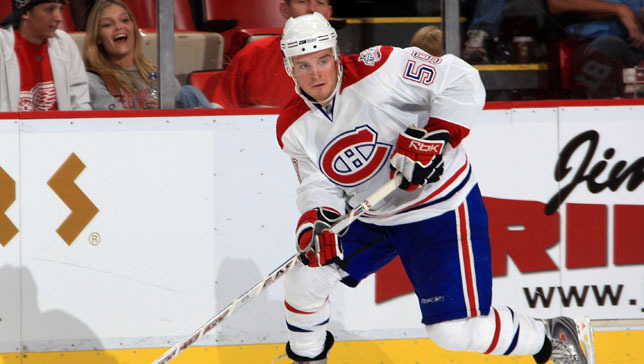 A native of Brandon, Manitoba, Trotter joined the Canadiens as a free agent on February 7, 2008. In three seasons, from 2005-06 to 2007-08, the 5’10’’, 180 lbs forward totalled 76 points (32 goals, 44 assists) and 42 penalty minutes in 69 games with the WCHA University of Denver Pioneers. He led the team in scoring with 40 points in 40 games in 2006-07.